William the Dog Trainer: More dog supplies on a budget. The Lovely Shane and I recently attended a local Yard Sale. One of the items that I picked up is the red travel bowl that is setting on my work table in the office of the Dog Trainer Shack. This bowl is brand new, never used. It came with the tag attached that is setting to the right of the bowl. I paid the modest sum of $1.00 for this bowl. I could have probably negotiated a lower price but it seemed fair to me. 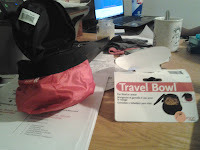 Just for fun, I looked up this travel bowl on the manufacturers web site. Apparently the red one is no longer available but they have one in slightly different color that you can order for $12.99. So, The Lovely Shane and I saved $11.99. I wrote this to encourage you to always look for bargains like the one I describe here. I am going to use this bowl to more easily provide traveling water for my little buddies. However, if you come across a bargain like this and you can not use the item, I strongly suggest and encourage you to purchase it an donate it to one of our local heroes of dog rescue. I am sure they would love to any supplies you can provide for their foster dogs! At this point, I normally tell you to contact me for your dog training needs then I close the post. Please do, as always contact me regarding your dog training needs or any questions/concerns you may have. However, I want to mention something personal here. The Lovely Shane and I attended a funeral today. My Father's sister, Alice Ruth Brown recently died. She had been battling various illnesses for sometime and died as a result of a recent bought of pneumonia from which she was ultimately too weak to recover. I mention my Aunt Ruth here because she was a real dog person. She loved toy breeds and miniatures. As a child I remember many times visiting with her in her living room while a chihuahua or a miniature dachshund sat in her lap getting petted. I got my first exposure to toy breeds and miniatures from this wonderful lady. She once gave us (my brother, me and my parents) a miniature dachshund girl named Baby. I have very fond memories of Baby and of my Aunt Ruth. The world needs more people like her! I already miss her. But, her suffering is over and she is in a far,far better place with our Lord!